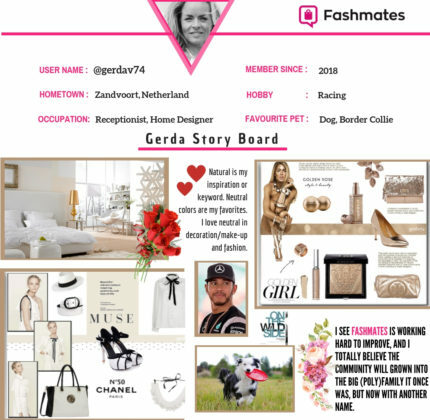 Introducing Gerda Verboom- Fashmates Brand Ambassador and Rockstar! We are excited to announce “Meet your Ambassadors” where we introduce our wonderful brand ambassadors to our Fashmates community so you can get to know them a little bit better. Today’s post will be about Gerda Verboom a talented creator and our very first ambassador. I am 44 years old and live on the beach in Zandvoort in The Netherlands with my husband Ivan. I love home decorating, so our home changes a lot- that doesn’t mean new furniture every time but I like style it myself- this year it is all in beach style, white/wood/ and light blue. As a young child, I painted my room with nail polish, so my artistic flair has always been there! I hated school but I’ve always wanted to work- most jobs I’ve had were in tourism but my last job was receptionist at one of the world largest media agencies. It was a less time consuming job which was great because I had a dog at that time, a beloved border collie, who passed away in 2017 at the age of almost 15 years old. We still miss her every day. What is something people don’t expect about you? I am a huge racing fan, especially Formula1 and IndyCar. Since 2007 I’ve been a true Lewis Hamilton fan. Being a Dutchy, I now cheer for Max Verstappen as well! Why do you create sets? I started on Polyvore when my father unexpectedly passed away. It was my way to express myself by creating sets and to clear my mind of things, an escape you can call it. I was so amazed by all the beautiful creations people were able to make. It didn’t take long before I could call myself an addict! I was able to put my creativity into sets and get into contact with people all over the world. I was completely shocked when I found out Polyvore was gone. I couldn’t believe it- not just losing the sets, but also the people I was in contact with. That’s why I was so excited when I heard about Fashmates! How did you find Fashmates? What an amazing surprise it was, when I saw a tweet with #bringpolyvoreback from Fashmates, that an alternative was made! At first it took a while getting used to Fashmates, but since the editor has been changed to be more like Polyvore, I just can’t stop making sets again. Some of my old Polypalls were also on Pinterest, so I also contacted them to spread this great news! I see Fashmates is working hard to improve, and I totally believe the community will grown into the big (Poly)family it once was, but now with another name. Natural is my inspiration or keyword. Neutral colors are my favorites. In most of my sets you see those colors back. I love neutral in decoration/ makeup and fashion, although I have to admit more than half of my closet is black! For decorations I like by nature inspired items. Wood, twigs and branches, shells, pinescones , berries etc. There is so much beauty to find in nature if you look for it. At home I have a huge standing lamp only made by big branches and some rope. Why did you decide to be a brand ambassador? We hope you enjoyed getting to know Gerda. It is our wonderful members and brand ambassadors that help bring the community back together. If you are interested in being a brand ambassador drop us a note at community@fashmates.com !